Want more variation in your workspace? Electric height adjustable desks are just the thing you need. With its push-button height adjustment, users are seconds away from a workspace that fits their exact needs. Especially in the past few years, you’ve probably heard about “sitting disease.” Sitting for long periods of time has not only shown to increase some health risks—it’s also just plain uncomfortable. So is improper posture regardless of whether you’re sitting, standing, or doing yoga. Everyone has different needs; adjustable desks make it easy to meet all of them for an efficient and productive work environment. This is doubly important in workspaces that cycle between multiple users so everyone’s needs are met. 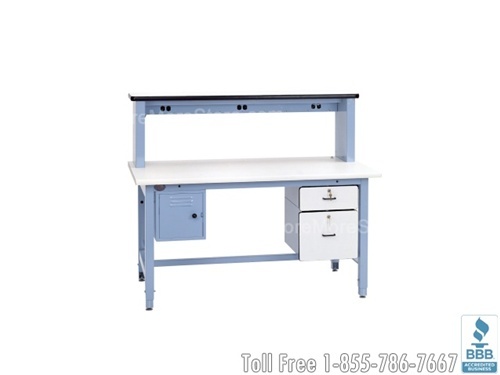 With its electronic components, the desks are also incredibly easy for anyone to use. The desks are capable of four pre-programmed heights so frequent users can simply push a button to set up their workspace. Then, users can manually tune the desk height to the exact inch at a rate of 1.5″ per second. Additionally, the desks come pre-wired and are fast and easy to set up; just attach the legs and feet. 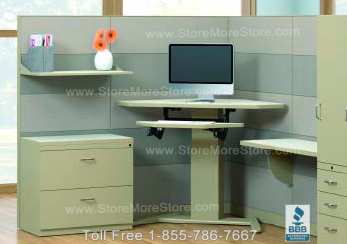 Choose from multiple models and colors depending on your needs, including desks with capacities up to 275 lbs. and optional sliding desk drawers. Electric height adjustable desks are available to buy online and ship within 5-7 business days with free dock-to-dock shipping included. If you need any assistance or just want some help picking the right solution for you, please call us at 1-855-786-7667. Employers and employees are accustomed to chairs that are height adjustable because of the increased focus on ergonomics and health. However, proper workplace ergonomics shouldn’t just be limited to chairs; they should extend to all work surfaces. That is why StoreMoreStore offers great deals on all types of ergonomic height adjustable computer desks and workbenches. Over time a computer desk or workbench that is positioned too low or too high can cause discomfort or musculoskeletal problems. With improperly positioned computer desk, workers may rest their arms at an uncomfortable angle on the desk while they are using the mouse or keyboard. In addition, a workbench that is positioned too low can cause employees to hunch over, which can cause strain on their back. Fixing the height of the chair will only go so far to help solve the problems. 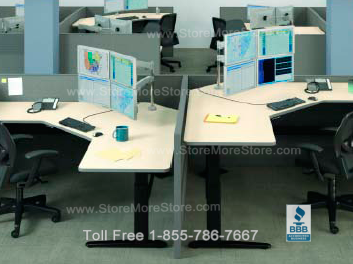 A complete solution involves ergonomic height adjustable computer desks and workstations. • Corner unit computer desks provide maximum space efficiency. • You can automatically lower or raise the computer desks or workbenches with just the push of a button. 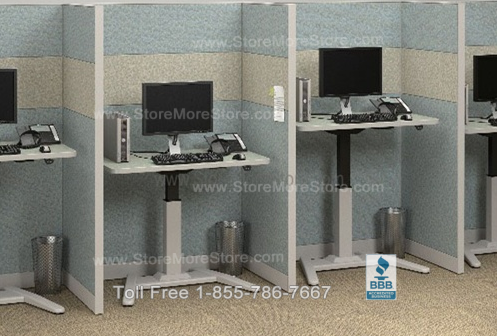 • Height adjustable computer desks are ideal for shared workstations because each employee can correct the desk to meet their ergonomic needs. • Employees have the option to work standing up with our height adjustable computer desks and workbenches. • You can use our computer desks with your existing panel systems with minimal retrofitting. 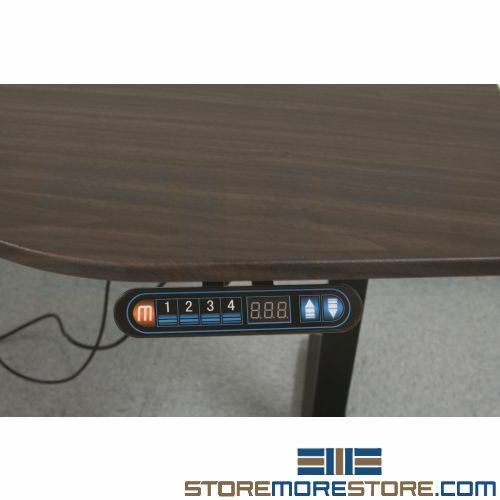 • Our height adjustable computer desks and workbenches will help employers maintain ADA compliancy. 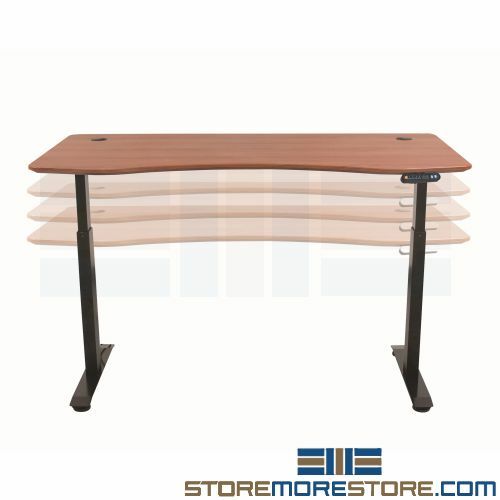 Shop online now at StoreMoreStore for new ergonomic height adjustable computer desks and workbenches! Also, to complement your workstation we offer ergonomic chairs at great prices. As usual if you have any questions, give us a call at our toll free number 1-855-786-7667 or send us a message.